At both our Thetford and Wardle sites we run the Solidworks CAD system with designers who are fully trained by authorised Solidworks training companies. Solidworks moves us into the future. In the old days we needed physical product samples and normally multiple samples were required before final pack design approval was granted. Today we can import the virtual product, in a wide range of formats, into Solidworks and create the packaging design around the product. We import the exact dimensions from customer CAD files eliminating guess work and subsequent redesigns and resampling. The quality team can highlight any ‘no contact areas’ such as very fragile connectors or finished surfaces to use. Production engineers can be shown how their parts will be packed into the packaging and can review pack times. 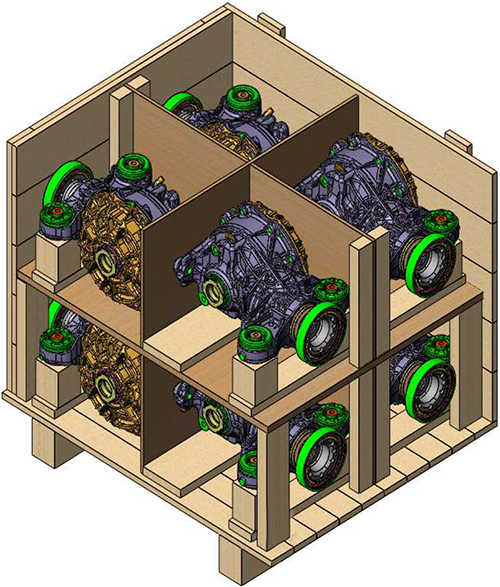 Logistics departments can view load plans for calculating efficient load models to dispatch the finished packs. We can offer concept pricing on the designs so that the finance team can buy into the process early on. The approved drawings then act as our internal control drawings against which all production is based. Any future revisions are logged and contained in one file giving complete traceability.